JOIN PURE SPEED RACING’S EXCLUSIVE 150 MPH CLUB! For those adrenaline junkies who want to go faster, here’s your chance! If you’ve successfully completed a 10 second pass in one of our Dragster Drive Experiences you can now up the ante and rocket down the drag strip, reaching speeds of approximately 150mph in a full 1/4 mile pass for the Ultimate Rush!! Experience the Thrill of Driving a Dragster again…but at faster speeds! Drive a Dragster for 6-Runs down the strip. Your Extreme Drive Experience includes two 1/8 mile runs and four 1/4 mile runs! Each run includes an electrifying burn-out and a heart-pounding launch off the starting line that will have you gripping the butterfly wheel with white knuckles!! All runs are done incrementally, at the instructors discretion, for safety reasons. Control your racing destiny with this thrilling adventure!!! *Extreme Drive Experience may not be available at all locations. 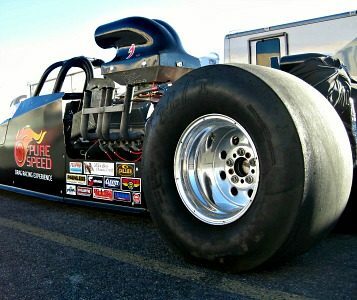 **You must have previous experience in our Dragster Drive program to qualify for the Extreme Experience. For your safety, participation in this program is up to the instructors discretion. Participants must have completed a previous dragster driving program to qualify for the Extreme Drive Experience. Participants must be 16 years of age with valid drivers license. Participants between the ages of 16-17 must have a parent or legal guardian present.